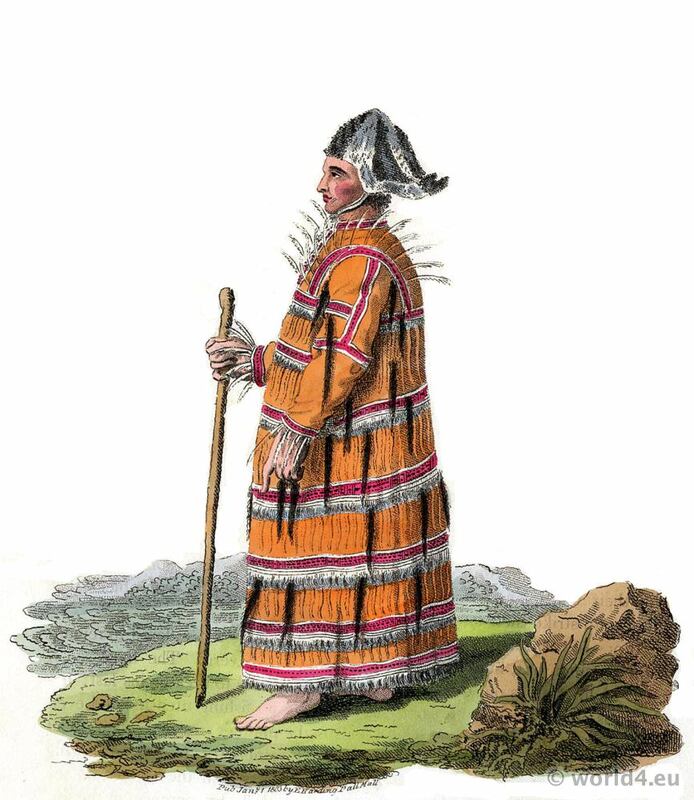 Home » Traditional Aleutian folk costume in 1803. Aleutian in his Winter Dress. Costume of the Russian empire. 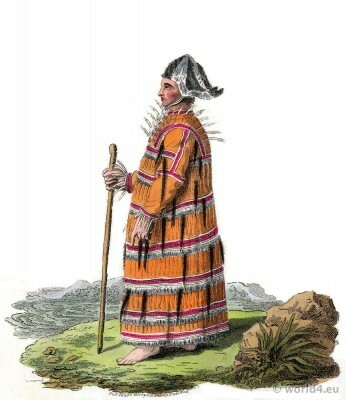 THE inhabitants of the Aleutian Islands wear a species of tunic, which descends as low as the knee, and is generally decorated with leather fringe. It is made of the skin of sea fowls ; the females prefer the skins of otters, foxes, &c.
The women arc employed in collecting these skins and sewing them together; and though they only make use of fishes bones for needles, and the sinews of animals supply the place of thread, they sew them with singular dexterity. As these skins are not impenetrable to the wet, they wear a sort of cloak made of the bladders of the sea lion, &c. To sec them in this garment, a stranger, like the companions of Captain Cooke, would suppose them to be dressed entirely in parchment. They wear neither breeches nor stockings, and suffer no inconvenience from walking barefooted upon the snow. Their winter caps consist of birds’ skins, with the wings and tail left standing. In summer they generally go bare-headed. Travellers speak, however, of a cap worn in this season ; but in all probability it ought rather to be considered as a defensive weapon. It is of wood dyed of various colors, and a sort of border, which projects nearly a. foot and a half in the front, gives it the appearance of an ancient helmet. Compared with the custom of European nations, their marriages are scarcely deserving of that name. As soon as a man possesses the means of supporting himself by his labour, he pitches upon a female, whom he con-ducts to his hut, and from that moment they are married. Sometimes they lend their wives, and sometimes exchange them for the first object that happens to strike their fancy. If one of them happens to fall dangerously ill, he is not suffered to remain in the common hut, but is carried to a separate cavern. The deceased is left, with his clothes on, in the hut where he happened to breathe his last: be-fore he is covered over with earth, his hunting and fishing utensils, and even his canoe, arc placed around him. This is the manner in which their dead are usually buried ; but to their chiefs and principal men the following singular honour is accorded. The dead body, dressed in the clothes of the deceased, is placed in a small canoe, and suspended, by perches, in the air, where it is left to putrify. This entry was posted in 1803, 19th Century, Asia, Russia, Traditional and tagged Aleutian Islands costumes, Edward Harding, Russian national costumes on 10/7/14 by world4.